Ever since Beijing allowed Chinese companies (even certain state-owned enterprises) to officially fail for the first time in 2016, and file for bankruptcy to restructure their unsustainable debt loads, it's been a one-way street of corporate bankruptcies, one which we profiled last June in "Is It Time To Start Worrying About China's Debt Default Avalanche", and which culminated with a record number of Chinese onshore bond defaults in 2018, as a liquidity crunch sparked a record 119.6 billion yuan in defaults on local Chinese debt in 2018. And by the early look of things, 2019 won't be any better after two large Chinese borrowers missed payment deadlines this month according to Bloomberg, setting the scene for even more corporate defaults, and "underscoring the risks piling up in a credit market that’s witnessing the most company failures on record." The first one was China Minsheng Investment Group, a private investment group with interests in renewable energy and real estate, which failed to make a Feb. 1 bond payment to creditors. 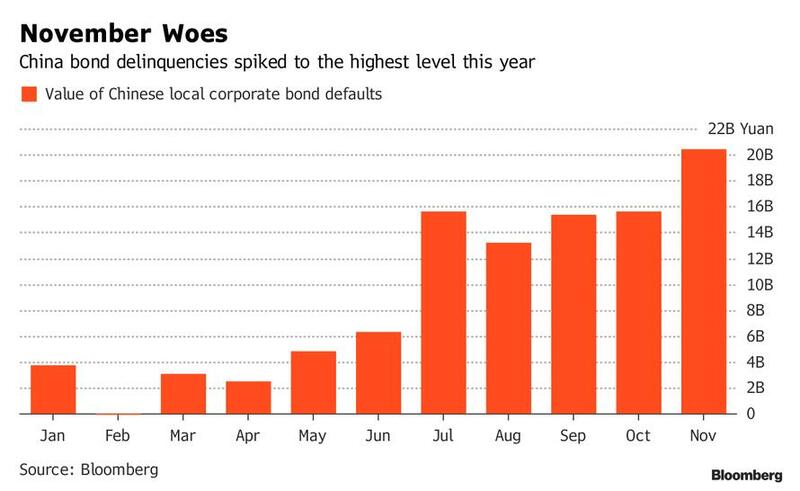 The Shanghai-based financial conglomerate didn’t repay investors in a 3 billion yuan bond that matured Jan. 29, then pledged to give them their money back three days late, Bloomberg News reported previously. But that didn’t happen. The firm, one of the largest private investment champions in China, was backed by 59 non-state companies and obtained an operating license in 2014, it said in a November bond prospectus. China Minsheng Investment had 232 billion yuan in total debt and 310 billion yuan of assets as of June 30, according to Shanghai Brilliance Credit Rating & Investor Service Co. The second name is familiar ever since its woes first emerged in 2018: Wintime Energy, which defaulted last year, also didn’t honor part of a restructured debt repayment plan last week. What is notable about these two latest payment failures is that both companies are "big borrowers" as Bloomberg put it, and their problems accessing financing suggest that "government efforts to smooth over cracks in the $11 trillion bond market aren’t benefiting all firms." In fact, when China Minsheng ends up defaulting, it would rank alongside Wintime Energy as one of China’s biggest failures, with 232 billion yuan ($34.3 billion) of debt as of June 30. Making matters worse is that while that amount of corporate defaults so far has been relatively small to China’s economy or outstanding debt, it has sent "shockwaves" through a market where inconsistent government appetite for bailouts and the prevalence of shadow financing "can make it hard to tell who’s on the hook for losses." For now, Wintime Energy is trying to keep the dream alive, telling investors that it’s still seeking financing to repay 20% of the principal on a 3.8 billion yuan delinquent bond, which however is already in default as it was meant to be returned on Feb. 6. The coal miner made the headlines in 2018, when it became China’s second-largest bond defaulter after it found itself incapable of servicing debt that had quadrupled in less than five years. Meanwhile Beijing, having let the bankruptcy genie out of the bottle some three eyars ago, has found itself seeking to limit the fallout from its deleveraging campaign by adding cash to the financial system and unveiling stimulus such as increased infrastructure spending, a boon to indebted property and local government borrowers. While that’s restored demand for some risky debt, the impact has been uneven and corporate bankruptcies have accelerated. 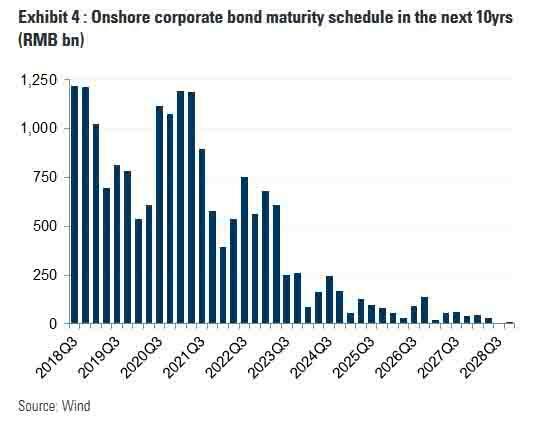 Making matters worse, the bond maturity schedule is staggering with trillions in corporate bonds set to mature in coming quarter, assuring even more defaults to come. Meanwhile, as we discussed last week in "Seven Reasons Why China Is Facing A Hard Landing In 2019" and confirming the rising market stress and inability of companies to fund themselves at permissive rates, the yield spread on five-year AA- rated notes, which in China is considered "junk", is still more than 300 basis points over AAA-rated peers, more than twice the level of a year earlier. The “market is clearly pricing in a lot of credit differentiation as access to refinance remains firmly shut for certain issuers yet widely open for others," said Anne Zhang, executive director for fixed income, currencies and commodities at JPMorgan Private Bank. "Defaults will become more frequent yet more idiosyncratic." And while so far Beijing has watched from the sidelines, should the falling dominoes accelerate or take down a particularly large piece, China's leadership will have to make a big decision: let the deleveraging process progress, even as it increasingly threatens financial stability, or once again step in and confirm to the world that there is no centrally planned financial system quite like a Chinese financial system.